Construction on units 3 and 4 of Plant Vogtle. Georgia Power Co. The costs include $700 million in additional subcontractor costs and an additional construction contingency estimate for nuclear reactors, which Southern's Georgia Power Co. unit is building with a group of public power companies. The company's decision to eat millions of dollars in costs associated with a large power plant is a bitter reminder to investors of its next-generation coal project in Mississippi. Southern took back-to-back quarterly losses amounting to billions of dollars with the Kemper County energy facility because of a settlement with Mississippi utility regulators. Unlike Kemper, Southern does not own the technology associated with Vogtle. This is also the first year that the company's nuclear unit and Georgia Power are fully in control of the project. The additional $700 million in higher capital costs for Vogtle stems from finalizing contracts with Bechtel Corp. and more than 60 subcontractors, labor productivity rates and craft labor incentives, Southern reported in its 10-Q filing. Project management, oversight and engineering support have also added costs, the report said. Vogtle's new revised capital and construction cost forecast for its 45.7 percent of the nuclear project is now $8.4 billion, up from $7.3 billion. This is based on a newly revised cost-to-complete estimate from Southern Nuclear, the company said. Georgia Power will file the revised cost estimates with the Georgia Public Service Commission later this month. The utility also will ask regulators to sign off on $578 million in construction capital costs from the first six months of the year. Georgia Power is absorbing the costs just months after the PSC approved Vogtle's new cost and schedule. The electric company told the PSC last year that the entire project would fall apart if regulators did not sign off on the revised cost estimates. The utility and Southern Nuclear have been adamant to regulators that they will be able to stick to the new schedule. In today's filing, Southern included boilerplate reasons that could change Vogtle's new projected schedule and estimated cost. Should that happen, it will cost the company roughly $62 million a month, including $50 million in capital costs. The company noted that Georgia Power is not precluded from asking to recoup that amount from its customers but said "management will ultimately determine whether or not to seek recovery," adding that such charges could be material. Southern announced just a week ago it would release its quarterly earnings earlier in the morning than usual. It also scheduled a routine conference call with analysts at 8 a.m. instead of the 1 p.m. time slot it has held for more than a decade. That the company opted to hold a pre-market analyst phone call prompted speculation from many in the industry that Southern would be making a significant announcement that likely would be negative for its investors. The company reported a second-quarter net loss of $154 million, or 15 cents a share, compared with a net loss of $1.38 billion, or $1.38 a share, a year ago. Other factors outside of Vogtle also contributed to the net loss, Southern reported. Vogtle is the only nuclear project under construction in the United States, and a decision from the utility and state PSC last year to finish the reactors was for a combination of political, economic and emotional reasons. The company and the PSC argue that the reactors will put emission-free baseload electricity on the grid for decades. 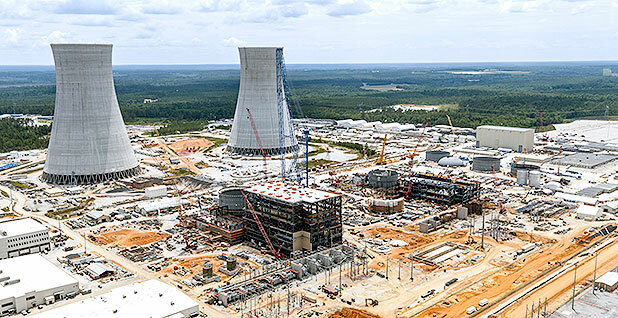 Vogtle and a similar project in South Carolina hung in the balance last year after the main contractor, Westinghouse Electric Co. LLC, went bankrupt. The reactors were already years behind schedule and billions of dollars above their originally forecast budgets by then. The electric companies in South Carolina walked away after deciding the reactors were too expensive to finish and found themselves in a political, legal and economic mess. Members of the Georgia PSC staff said the new costs were too much for customers to bear and that Vogtle should be canceled unless the utility absorbed some of the increase. The PSC again greenlighted the reactors but placed some financial constraints on Georgia Power if it again failed to meet the new deadlines. Right now, work at the two reactors is moving ahead of schedule, and consultants have said it's too early to tell whether things will stay that way. The electric company must continue to hire craft workers and ramp up productivity to an aggressive rate that has never been met at the project. Georgia Power also recently halted work at Vogtle to review safety and performance standards (Energywire, Aug. 1). The company followed up with what the company called "intensive discussions" with workers the following day.